Ignacy Jan Paderewski was born in 1860 in the village of Kurylowka, Podolia, Poland. He studied at the Warsaw Musical Institute and with many Eastern European teachers. He became one of Poland’s world renowned pianists and composers. Although his own compositions are well known, Paderewski was widely praised for his renditions of Chopin. In addition to delighting Poland and the world with his music for over 50 years, Paderewski also became one of Poland’s great statesmen. 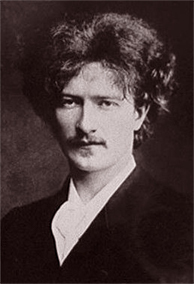 At the beginning of World War I, Paderewski founded a committee to assist the people of Poland and established branches in Paris, London and throughout the United States. Paderewski’s efforts, with support from the American government and American people, helped Poland regain her freedom after World War I. He was also one of the signers of the Paris Peace Treaty which was responsible for reestablishing the proper boundaries between Poland and her neighbors. Paderewski became the chief framer of the Polish Constitution of 1919 and served as Poland’s delegate to the League of Nations in Geneva. Upon Poland’s Independence, in 1918, Paderewski became its Prime Minister and Secretary of Foreign Affairs.